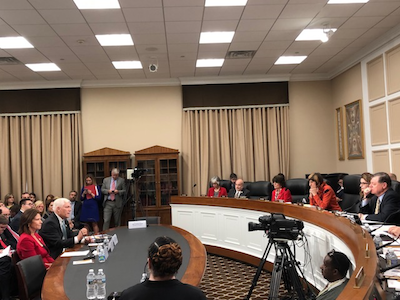 Today I testified before the subcommittee as a father, as a Member of Congress, and as a fierce advocate for the disability community to stress the importance of continuing research for Down syndrome. My son Alexander Gregory Sessions is a 23 year old Down syndrome young man, an Eagle Scout, an avid athlete, and the newest member of the Home Depot team in Dallas. Alex is like so many other individuals with Down syndrome who are active in their communities and who want to live their lives to the fullest. Through the efforts of the NIH and individuals such as my dear friend, Dr. Bill Mobley, we have made great strides in research and improved the quality of life of individuals with intellectual disabilities. In the 1950's the average age for an individual with Down syndrome was nine years old. In the 1980’s it went up to 25, and now it is almost 60. This improvement is the result of the commitment and resolve of the medical community to provide these individuals with the opportunities to live longer, healthier lives. While the NIH and doctors like Dr. Mobley have made remarkable advancements, there is so much that we still do not know. That is why it is critical that we contribute more resources so that we can make greater advances, especially in regard to the link between Alzheimer's and Down syndrome. Studies have shown that individuals with Down syndrome can begin showing signs of memory loss starting as young as 25. As a father, it breaks my heart to know that these young men and women may have to go through this and are at risk of losing precious memories that have shaped their lives. Throughout my time in Congress I have worked tirelessly to pass legislation that breaks down barriers for individuals with disabilities. In addition to this work, research and medical developments are critical to our success and that is why I will fight to ensure they have the resources they need so we can break through the glass ceiling for the disability community.